For Fun, Recreation, Perfection & Racing. Designed specifically for kids, the O’pen BIC is a true glide machine for real excitement on the water. The O’pen BIC, with its modern and powerful rig, is a fast boat, quick to respond, self-bailing, and is fitted by the best marine hardware manufacturers. 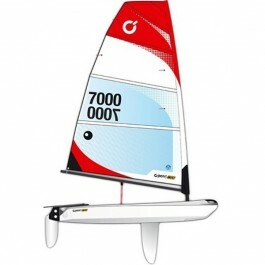 The fast, planing hull of the O’pen BIC gives a dynamic sailing experience of a true dinghy that heels. Being at the helm of this powerful machine gives you the same excitement normally experienced on a boat for adults. With its 60-foot Open design, including a totally open self draining stern, even capsizing is fun! Young sailors are fully independent on the water and will be proud to sail such a modern-looking and elegant boat, one that both sails and looks like the boat of today’s champions. On the hull, the shaped daggerboard and rudderblade, and all deck equipment and fittings are worthy of the most modern dinghies: Ronstan Cunningham pulleys and Ronstan mainsheet ratchet block, Robline ropes…. The rig includes a fully-battened North 4,5m2 mono-film sail with mast pocket, similar to that of a windsurf board. Rigged on an epoxy mast, the sail has been designed with an open leech to give sailors maximum control and performance in windy conditions.